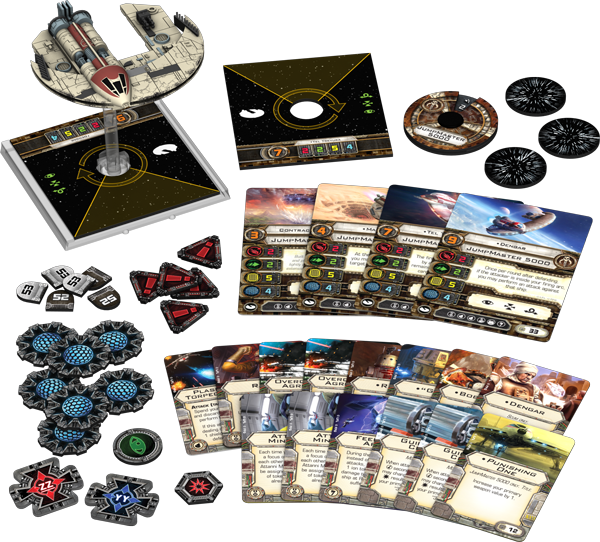 The eighth wave of starship expansions for X-Wing™ is now nearly here! 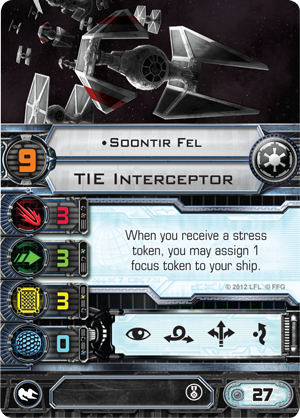 Over the course of our previews, we've taken a look at the Ghost, the Inquisitor's TIE Advanced prototype, and theMist Hunter. 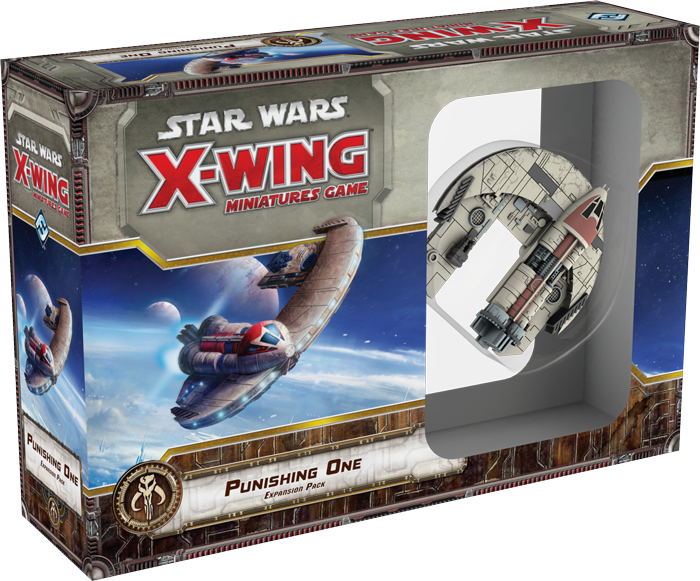 We've also seen the T-70 X-wing and TIE/fo fighter, which were added to the wave after the announcement of The Force Awakens™ Core Set and then raced ahead of the rest of the wave's ships, releasing just before the new movie. 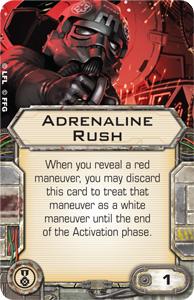 Today, we complete our exploration of the Wave VIII expansions with a look at its second Scum and Villainy starship, the large-base JumpMaster 5000 from the Punishing One Expansion Pack. 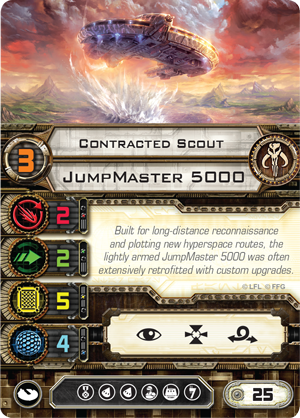 Designed to scout new hyperspace routes and discover new systems, the JumpMaster 5000 was a crescent-shaped transport built to travel long distances. It was also known for its ease of maintenance and customization. 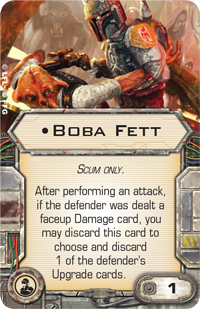 These latter points led the Corellian bounty hunter Dengar to choose the ship as his personal vessel, and his heavily modified Punishing One was a far cry from a base JumpMaster 5000, armed with a proton torpedo launcher and upgraded with a cutting-edge engine bay that gave it real punch in battles at sublight speed. Additionally, Dengar integrated an astromech droid into the ship to serve as a gunner, thus freeing himself to focus on flying. 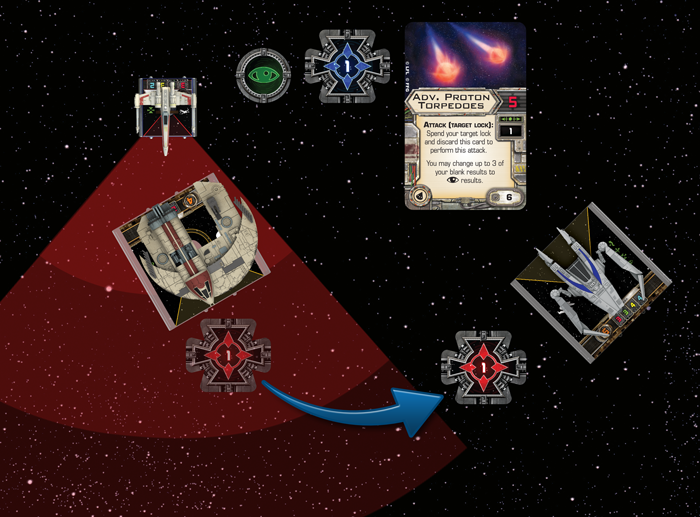 In X-Wing, the JumpMaster 5000 appears as a large-base, turret ship for the Scum faction. Its durable design translates to four shields and five hull, and it pairs this durability with fair attack and agility values of two dice each. 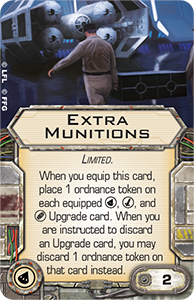 Of course, Dengar's Punishing One is even more deadly, and the Punishing One arrives as a Title upgrade that boosts the ship's primary weapon by one for twelve squad points. 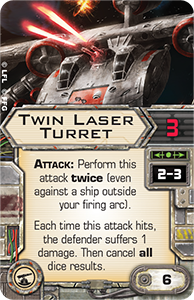 Those twelve squad points might seem a steep price to pay to gain one extra attack die, especially when you can findTwin Laser Turrets nearly everywhere you look for just six squad points. 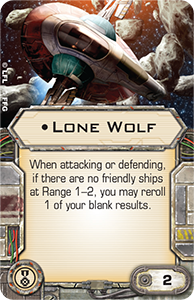 Still, you have to remember that those twelve squad points add to a primary weapon that can fire in a full 360-degree arc and that doesn't suffer from the same damage or range restrictions as a Twin Laser Turret. Moreover, if you have Dengar flying his Punishing One and you catch your foe in arc, you can double the value of your Punishing One upgrade when you fire both as the attacker and then after you defend against your opponent's attack. Before long, you will have your foes reconsidering whether or not they even want to fire at Dengar, and those twelve squad points that you spend on the Punishing One Title and the extra bit of offense it grants you will soon look like a tremendous bargain for your squad's single greatest defensive upgrade. 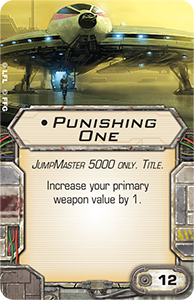 Of course, there are other ways to upgrade your JumpMaster 5000 than with the unique Punishing One upgrade. In fact, there are plenty of options. 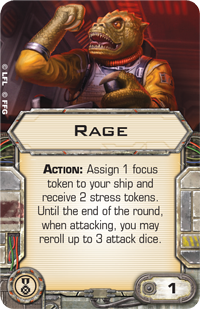 The ship is the first to pair the crew and Salvaged Astromech upgrade slots, and it boasts two torpedo slots, meaning that you can equip as many as two torpedoes or one set of torpedoes along with the Extra Munitions upgrade. 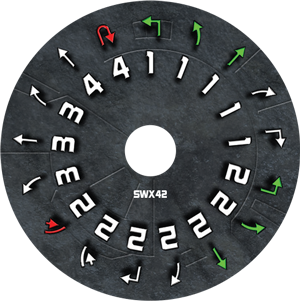 Finally, it sports an illicit upgrade slot and the first asymmetrical maneuver dial in the game. Clearly stronger to its left than to its right, the JumpMaster 5000 boasts far more green on its dial than red, but if you need to clear stress, your opponent is going to know that you will not turn right. This would be far more limiting if it were not for the white speed "2" Segnor's Loop that the JumpMaster can also take to its left. Sure, there may be occasions that your opponent will know that you are going to veer left, but you can still threaten to line up a Range "1" shot—in arc—against any rival foolish enough to follow you. All told, its unique maneuver dial and many possible upgrade combinations make the JumpMaster 5000 one of the most interesting starships in the Scum faction's hangar bay, and how you choose to outfit and fly it will depend almost entirely upon how you intend to use it in your squad. There is no softer way to put this… flying the JumpMaster 5000 can be tricky. It will likely require some advanced planning. Any turn that you intend to clear a stress token, you will need to go left or go straight. Your opponent will know this, too. You might think that the easy answer is to line up along the right side of the map and time your approach to turn left into your opponent, but what if you turn too early? 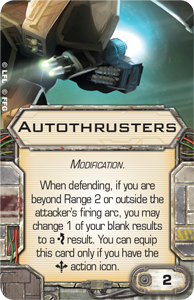 What if your opponent survives that initial turn and gets out of arc with Autothrusters on your right side? Because the JumpMaster 5000 is a turret ship, these concerns are mitigated slightly, but not always. 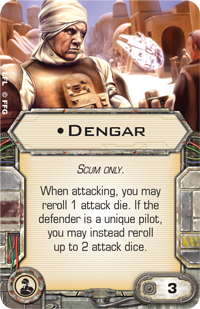 Dengar, for one, wants to keep his opponents within his firing arc—not just some of the time, but all the time, and that requires some fancy flying with a ship that might not always lend itself to the cause. If you fly Dengar, you will likely find that correctly timing your Segnor's Loop maneuver will be a crucial component of your success. Of course, these concerns will also trickle over to your choice of upgrades. 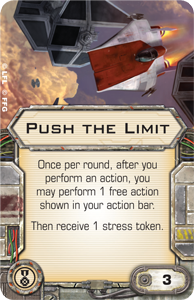 As strong as elite pilot talents like Push the Limit and the new Rage may be, they will heap stress upon your JumpMaster that may make it predictable. Instead, you might equip upgrades like Lone Wolf or Predator to modify your dice, or you might take Adrenaline Rush to surprise your opponents with a white speed "4" Koiogran-turn or a Segnor's Loop to the right. 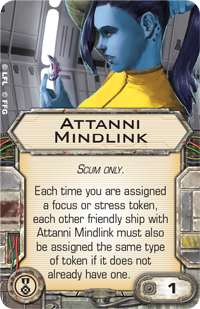 The new Attanni Mindlink offers yet another option that is every bit as unusual and tricky as the JumpMaster 5000 itself; each time your Mindlinked pilot gains a focus or stress token, it grants that token to each other Mindlinked pilot without a similar token. At its best, it offers a cost-efficient way for multiple pilots to gain extra actions, but at its worst—if you misplay it—the Attanni Mindlink can saddle multiple ships with unwanted stress. 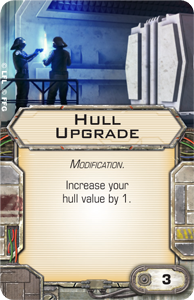 Similarly, you will find some interesting options within the existing Salvaged Astromech upgrades. 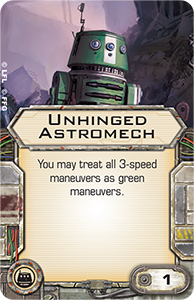 For example, theUnhinged Astromech can transform all your speed "3" maneuvers into green maneuvers, affording you more maneuverability. 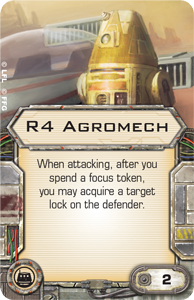 Alternatively, since Dengar can potentially fire twice in a round, he might appreciate the target lock that an R4 Agromech would grant him after he uses a focus token to modify his first attack. 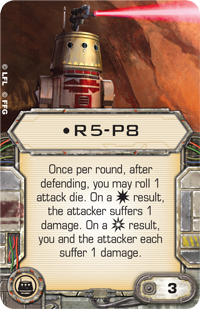 On the other hand, you could take advantage of the new Salvaged Astromech upgrades from the Punishing One Expansion Pack, includingR5-P8 , a Salvaged Astromech that plays well into Dengar's penchant for payback. 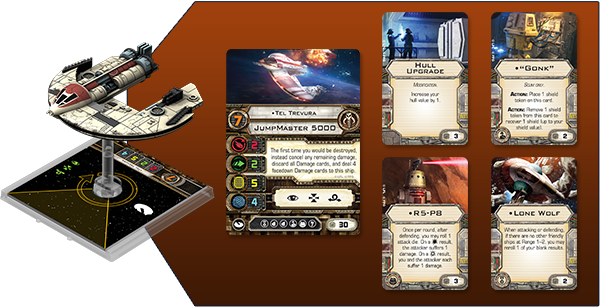 Notably, the JumpMaster 5000, with its Salvaged Astromech slot, does more than offer you the chance to equip a vengeful droid like R5-P8, it allows you to equip such a droid on the same ship as the Boba Fett crew upgrade designed by World Champion Paul Heaver. At this point, no other ship in the game pairs these two types of upgrades, and that means no other ship can replicate Dengar's potential to strip the shields and Twin Laser Turret off a Y-wing or the Push the Limit elite pilot talent off Soontir Fel —all immediately in response to defending against one of their attacks! Finally, you could choose to pilot your JumpMaster 5000 with someone other than Dengar. In fact, given that that a Contracted Scout will enter your squad for only twenty-five squad points, you could theoretically choose as many as four someones to fly to battle in JumpMaster 5000s. 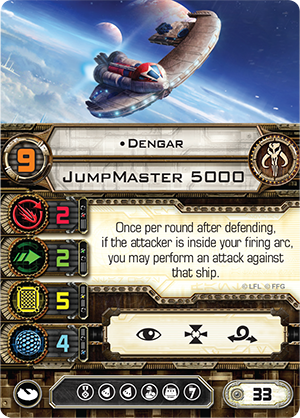 However, given the utility of Dengar's unique talents and those of the expansion's other unique pilots, Manaroo and Tel Trevura , you will most likely see the JumpMaster 5000 fielded for quality over quantity. These other pilots open a whole range of possibilities, but there are a couple of things worth noting at this time. 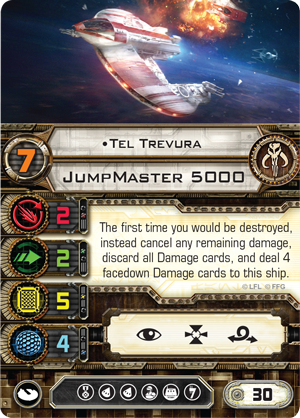 First of all, Tel Trevura is really good with a Hull Upgrade . 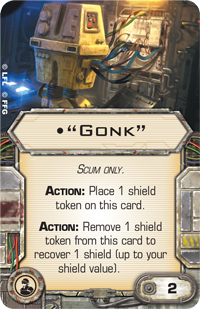 Give him the shield-regenerating "Gonk," R5-P8, a Hull Upgrade, and a defensive elite pilot talent like Lone Wolf, and Tel Trevura becomes extremely difficult to kill. 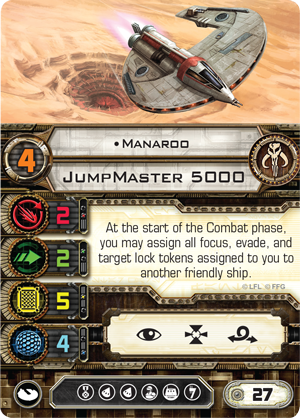 Meanwhile, while it may be easy to see how Manaroo can support other ships, it may be a little less obvious that her ability to transfer target lock tokens—all target lock tokens—to any other friendly ship on the table can, in effect, make her immune to missiles and torpedoes that require the expenditure of target locks. Naturally, it also makes it harder to hit her with fully modified attacks, and as a result, your opponent, wanting to avoid the headache of killing her, might focus fire elsewhere—even if doing so is the wrong play. In either case, the choice to pilot your JumpMaster 5000 with someone other than Dengar may be a good one, if only because it means that you can then take the Dengar crew upgrade. 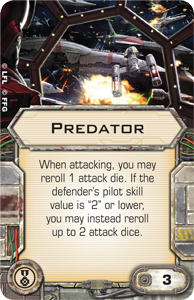 At three squad points, he is very nearly a crew upgrade version of the popular Predator elite pilot talent, meaning that you can have that upgrade's benefits and still take a different elite pilot talent. 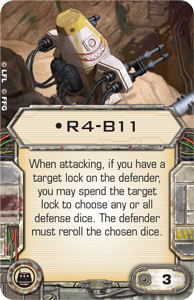 Moreover, the fact that the Dengar crew provides you access to dice rerolls means that you might not need your target locks so much to modify your dice, allowing you to spend your locks so that R4-B11 can force a reroll of your opponent's defense dice.